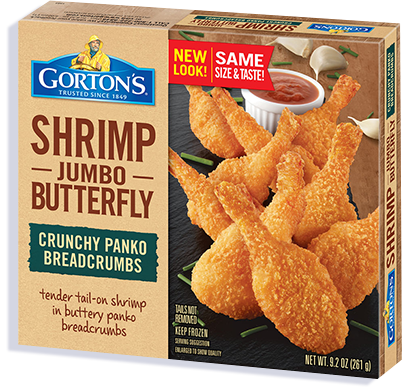 Whether it’s snack time or mealtime, it’s always the right time for Crunchy Butterfly Shrimp. The extra crunchy panko makes them extra delicious, especially paired with your favorite dip. 3. Bake 16-20 minutes total* Flip after 10 minutes. Enriched bleached wheat flour (flour, niacin, iron, thiamin mononitrate, riboflavin, folic acid), water, yellow corn flour, wheat flour, modified corn starch, salt, romano cheese (milk, cheese culture, salt, enzymes), dextrose, whey, maltodextrin, yeast, sugar, butter (cream, salt), natural flavor, garlic powder, baking powder (disodium pyrophosphate, baking soda), nonfat milk, xanthan gum, guar gum, methylcellulose, citric acid, paprika extract (color).